Home > COMET INDUSTRIES BELTS > COMET INDUSTRIES 203786-A/DF CVT BELT > Comet 203044A. 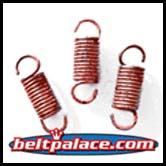 Package of 3 “Spring Clips” for Comet Industries 40 SERIES “40C” Drive Clutch. Comet Industries 203044-A. 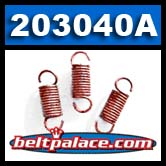 > Comet 203040A RED Clutch Springs. Package of 3 RED Springs for 40C Drive Clutch. Drive Clutch Engagement with RED spring 203040-A (#28): Camroller 203648A (Heavy) at 2000 RPM, Camroller 203549A (Medium) at 2600 RPM, Camroller 203650A (Light) at 3100 RPM.